From challenged neighborhoods in Baltimore to the steamy banks of Uganda’s Lake Victoria, the Krieger School’s public health students are working to improve lives. 0n a cold Tuesday morning with light snow falling from a dull February sky, public health studies major Stephanie Irwin ’15 clambers aboard first one, then another Hopkins shuttle to make her way from the Homewood campus to the Johns Hopkins Bayview Medical Center in East Baltimore. She will spend the next three hours in a windowless room, helping low-income patients connect with social services, such as food stamps or GED classes. Stephanie Irwin ’15 counsels a client at Health Leads. 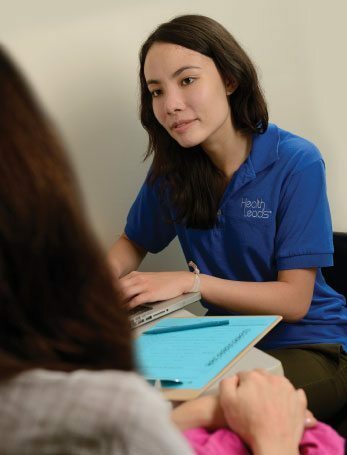 It’s Irwin’s weekly shift with Health Leads, a nonprofit group employing college-student volunteers and using health clinics as a point of contact to connect low-income patients with services they need. Patients fill out screening forms listing basic needs they are struggling to meet, and Irwin and the other volunteers help them navigate the public and nonprofit resources available, either in person or over the phone. The term “social determinants of health” refers to the conditions in which people are born, grow, live, and work and how these factors can affect health and well-being. In Baltimore, with its great socioeconomic disparities, a person’s zip code says a lot about how healthy he or she is likely to be. Irwin first encountered the concept as abstraction on a lecture hall white board. Health Leads puts it in her face. This sort of beyond-the-classroom exposure to public health issues is required of all students in the public health major. It’s called the Applied Experience. Irwin’s classmate Michael Longo ’15 recently got his own reality check, on the steamy banks of Uganda’s Lake Victoria. He was there in January as part of the public health studies study-abroad program focused on the African nation’s multiple health issues. He witnessed fishermen scrambling aboard fleets of flimsy wooden boats to cast nets all day in dangerous and backbreaking conditions. The study of public health has been around for centuries and became a critical field with the onset of the Industrial Revolution. Rapid urbanization and cramped conditions caused sanitation issues that led to disease among the working population. Today, as the planet’s population slides past the 7 billion mark, public health pressures mount—be they 7,000 miles away from Johns Hopkins in equatorial Africa, or just seven blocks distant on the back streets of Baltimore, where nearly one in four citizens lives below the federal poverty level. 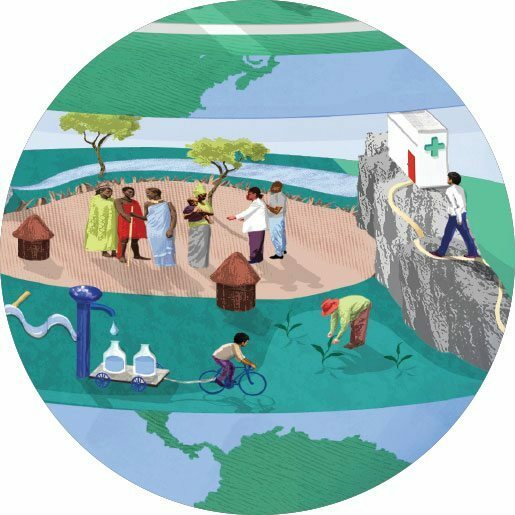 The challenge of addressing local, regional, and global public health needs is unglamorous, arduous, often underpaid … and more popular at Johns Hopkins than ever. For the last five years, public health studies has been the largest major at the Krieger School of Arts and Sciences. Interest in the major exploded tenfold among freshman applicants between 2002 and 2012. While 29 freshmen and sophomores took up the major when it debuted in 1975, today it is home to some 350 students. Hopkins helped pioneer the idea of undergraduates studying public health, and more and more colleges are following suit. Only 73 colleges offered such a major in 2000; now nearly 200 do, according to the Association of Schools of Public Health. Many schools have reached out to Johns Hopkins for help in getting their new programs started. The Krieger School’s interdisciplinary program with Hopkins’ Bloomberg School of Public Health is built around a quartet of foundation classes covering epidemiology, environmental health sciences, health policy and management, and biostatistics. Students spend their first three years taking classes on the Homewood campus and their last year at the Bloomberg School taking upper-level electives alongside graduate students. There is also a joint BA/MHS track. Having such ready access to the No. 1-ranked public health graduate school might explain some of the undergraduate major’s popularity. But there’s more to it than that. “Public health,” once a murky concept at best for many, is something that appears to have come into focus for the millennial generation. Scarsdale, N.Y., native Longo says he has long envisioned a career in medicine and plans to become a pediatric cardiac surgeon. Longo calls his time in Uganda an “absolutely unbelievable experience” and hopefully the first of many such trips to study and help address entrenched public health issues. Closer to home, whenever his academic and football practice schedules allow (he is team captain and a standout member of the defense), he volunteers at a Baltimore men’s shelter serving recovering addicts. Public health major Samuel Kebede ’15, meanwhile, didn’t need UNICEF or Bill Gates to expose him to international poverty and health challenges. He only had to look out his window. The native Ethiopian is from Addis Ababa, the son of doctors, and a member of the troubled country’s emerging middle class. The task of addressing this inequity drew him to the public health major. For his Applied Experience he returned to Africa during the 2011 intersession, this time to the Congo. The project he devised, facilitated by the World Health Organization (WHO) and the United Nations Development Program (UNDP), was to compile an annotated bibliography of that nation’s scattered and often haphazardly stored health data. “I was literally going from archive to archive in these really dark basements and libraries and trying to find books, reports, data—anything health or illness related within the context of the Congo,” Kebede says, noting that copies of his finished bibliographic document were given to both the WHO and the UNDP. When he looks at his fellow students, he sees a hopeful optimism—and not born of a naïveté or a vast underestimation of what will be involved in improving the health of billions of people. One early document detailing the major’s formation notes that a “primary motivation” for the professors to help create such an undergraduate degree was to “gain a source of outstanding Hopkins students for their graduate programs.” And they succeeded. Roughly 45 percent of public health studies graduates go straight on to a medical school or to graduate school in the field, with the lion’s share of them heading over to the Bloomberg School. About 35 percent enter the workforce—joining health departments or NGOs. (And among those going straight to work, most will end up in graduate school in a few years’ time after their real-world experiences help hone their professional focus.) About 10 percent can be filed under “other,” which could be a period of travel, or volunteering, or perhaps a bit of both, such as with the Peace Corps. Whither the Public Health Grad? Program alum Jeffrey Duong completed the joint public health BA/MHS program in 2009 and is on track to earn a Bloomberg School PhD in mental health this May. He wanted to become a physician when he first came to Hopkins in 2005 but soon found the pure science classes didn’t engage him. A friend told him to try public health. It was while volunteering as a tutor and aide at a West Baltimore after-school program that his public health aspirations came into focus. “I basically saw kids beating each other up all the time and saw that youth violence was a major issue and I really felt compelled to do something about it,” Duong says. More recent public health grad Minhaj Chowdhury ’11 is busy garnering investors for Drinkwell, a social enterprise he co-founded last year to tackle one of the most entrenched and tragic public health issues out there: the mass poisoning of Bangladeshis from arsenic in their groundwater. The World Health Organization warns that as many as 77 million people are at risk of ingesting this tasteless and odorless element that occurs naturally in the nation’s aquifer. As many as one out of four deaths in the country is related to arsenic poisoning, by some estimates. Chowdhury was one of those globalized Millennials who wanted to travel and learn about the world when he first came to Hopkins. In 2009, the Bangladeshi-American traveled to his ancestral homeland to install 100 household water filters in a remote village, a trek partially funded by the JHU Institute for Global Studies Summer Research Fund. When he returned to the village on a Fulbright Fellowship in 2011, Chowdhury was shocked to find that only three of the filters were still in place. The rest had been broken up and their component parts sold. “Turns out, giving away stuff is the worst thing you can do,” he says. Drinkwell takes a community-based, franchise approach to the arsenic issue by empowering local entrepreneurs to build central filtering hubs that can sell clean water to a whole village. The approach creates sorely needed jobs and incentivizes maintaining the equipment. “People will buy water when their friend sells it, rather than from a foreign NGO that rolls into the village in a white UN truck,” Chowdhury says of this market-based approach, a version of which one of his Drinkwell partners has already successfully tested in India. He hopes to begin in-country implementation in 2015. Sarah Benett extracts DNA from African mosquitoes to determine if they are carrying malaria. So will the major keep growing? “At some point, we will hit a plateau, but I don’t know where that is yet,” says program director Gebo. She notes, however, that the Association of American Medical Colleges is changing the Medical College Admission Test next year to include a greater emphasis on behavioral and social sciences. This might lead still more students to select public health studies or social policy studies as their pre-med degree. Since her arrival in 2005, Gebo has seen the number of public health studies faculty more than triple, and what was once a smattering of largely part-time advisers and administrators become a bona fide staff of half a dozen. Going forward, Gebo hopes to form new academic partnerships and collaborative classes. The Women, Gender, and Sexuality Program, the Center for Africana Studies, and the School of Nursing are some possible partners for collaborations and academic synergies. In the meantime, students keep finding their way to the program. Students like Sarah Benett ’16 from San Francisco, who credits her father for discovering it as they pored over various college catalogs. “He knew I always talked about wanting to help people, so I looked at it and fell in love with the major,” she says. Benett’s ongoing Applied Experience differs from the out-in-the-field work of her classmates Irwin and Longo, underscoring the diversity of opportunities within the major. Since last fall she has been assisting at the Norris Lab in the Johns Hopkins Malaria Research Institute and Department of Molecular Microbiology and Immunology at the Bloomberg School conducting lab work extracting the DNA from the bodies of mosquitoes collected in Zambia and Zimbabwe. She helps perform an analysis to determine their species, and if they are carrying malaria, information then conveyed back to Africa to help health workers target preventive measures. This Egyptian limestone relief of a crocodile resides in the Krieger School’s Archaeological Museum. JHU’s student athletes balance rigorous academics with demanding sports… and they love it.